Spicy, hoisin turkey, stir fried brussel sprouts, endamame, Chinese mushrooms, red bell and stuffing with cranberries and turkey gravy. I kept getting asked if I was going to ‘wok’ my turkey. 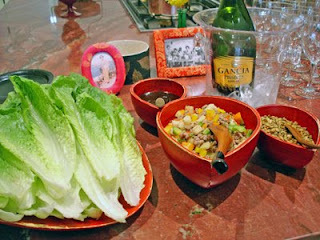 No, but I did give our Thanksgiving an Asian Twist this year! We had a cozy dinner for two and my game plan went smoothly! We watched “Survivor, Samoa” cause I was in Hong Kong and missed two episodes. Well, Thanksgiving needs to be traditional cause we only have it once a year! I mentioned to Ralph that we’d just have roast potatoes and not bother with stuffing (the one I got was full of bad stuff incl. MSG, I’m taking it back!) 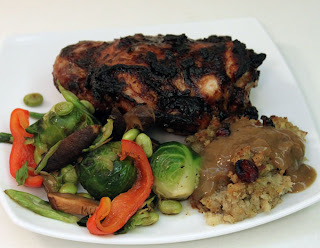 His retort, “Thanksgiving is nothing without stuffing!” kind of made me guilty. So, I ran out to Wholefoods, thank goodness they were open, very smart! They even had all prepared sides and was not that busy. 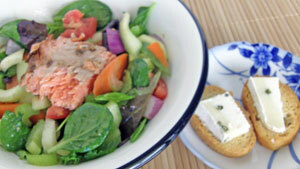 So, for lunch, we had a small salad with grilled salmon and a couple of garlic crostinis with goat cheese. Here’s how I marinaded some gigantic turkey thighs, I only used three ingredients which I constantly use and love. 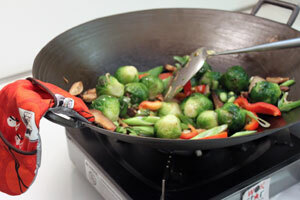 That’s why they’re included in my Wok Star Kit! 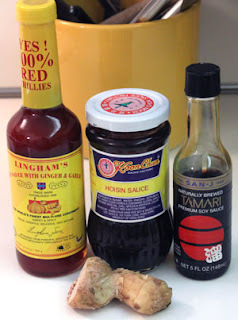 Koon Chun hoisin sauce, San-J’s tamari, Lingham’s chili sauce (you can get it at Epicure Market in Sunny Isles and South Beach and in Fort Lauderdale, The Grateful Palate who has hosted a couple of my classes). Take thighs (we like dark meat, more juicy) out of fridge an hour before cooking and marinade about 15 mins. prior to cooking. I don’t marinade overnight, not necessary but you can if you want. Ratio is 2 hoisin, 1 chili, 1 tamari. You can use any leftover sauce to marinade more meat or even toufu, I never waste anything. Mid afternoon: I rehydrated some Chinese mushrooms, prepped Brussel sprouts by parboiling and dunking in ice bath to keep them green. Defrosted some endamame (soy beans). 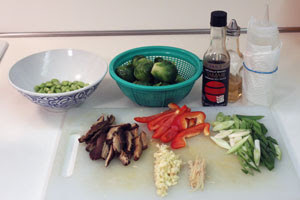 Chopped some garlic and ginger, scallions and half a red bell pepper for the stir fry. 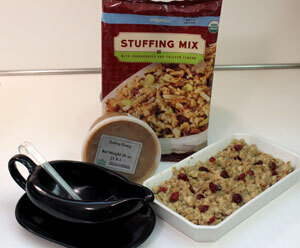 The Wholefoods stuffing had cranberries, so it was perfect, I’ve never liked cranberry sauce, way too sweet. Packet instructions were easy: add to boiling water but instead of 6 tablespoons of butter, I used canola oil. We don’t need extra calories and cholesterol with everything else in this meal. 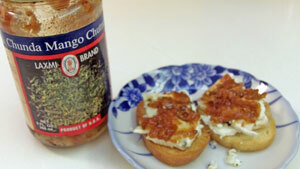 Just a little light appetizer: more garlic crostini with goat cheese and a dab of mango chutney. I’ve only just started buying goat cheese and am in love with it. It’s so light and fluffy and has so much less fat. 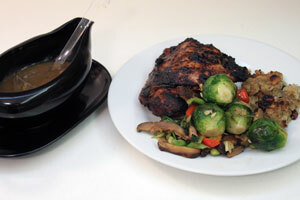 When it was time for dinner, I grilled the thighs and stir fried the veggies with a dash of tamari, sherry and lime juice to taste. You can find out more about this “mix and match” technique so your weeknight dinners are quick and easy! This is what being a Wok Star is all about! I heated the gravy in a saucepan and warmed the stuffing in the microwave. When the stuffing was warmed, I stuck it under the broiler to crisp up. I took the skins off the thighs, much easier after they’re cooked. Slathered marinade from the baking tray on the newly skinned thighs to give them flavor, color and crispy texture. Thanksgiving with an Asian Twist is READY! Did you give your Thanksgiving an ethnic slant? I would love to hear about it. 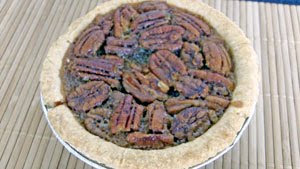 For dessert, I had bought Granny Smith apples and frozen pastry but Wholefood’s small pecan pie looked perfect. 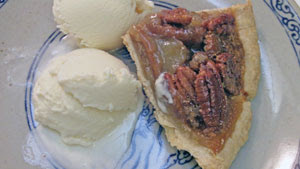 The crust was a bit disappointing but still satisfied, well, anything with ice cream is good, right? Ralph and I love turkey in any shape or form. I use a LOT of ground turkey, it’s in my Rainbow Lettuce Wrap appetizer which goes well with Gancia Prosecco and Tiger Beer which I serve in my Wok Star cooking class.